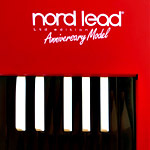 Nord User Forum - View topic - Nord Wave - used price? Nord Wave - used price? What's the price of used Nord Wave nowadays? I would have a chance to buy that (condition: good), but I have no clue because I've never owned Nord products myself. Re: Nord Wave - used price? The fact is, the Wave is still pretty unique. There were never a lot of synths able to use samples as oscillators, and the Wave is still actually very powerful. The current alternatives are only the Blofeld/Sledge (they share the same engine) which have less than 1/3 the sample memory of the Wave, and much less polyphony. Or the Prophet X/XL which is huge and prohibitively expensive. All in all, the Wave is still a very good option. So, 1200 US$ is a "fully yes, go and grab it" deal? The subject was at what price?.. Ok, it seems I'm going to get it cheap so this will be good addition to my other synths. Thanks all for the comments!